Feline lovers know that each cat has his or her own individual personality. Some are playful, some aloof. Some remain kittenish their entire life, while others seem born with a wise and understanding soul. They can be trouble-makers, angels, demanding divas, or best pals. As unique as they are, cats also boast an exceptional set of characteristics that sets them apart from every other species on the planet, including other domesticated animals. What makes ’em so special? 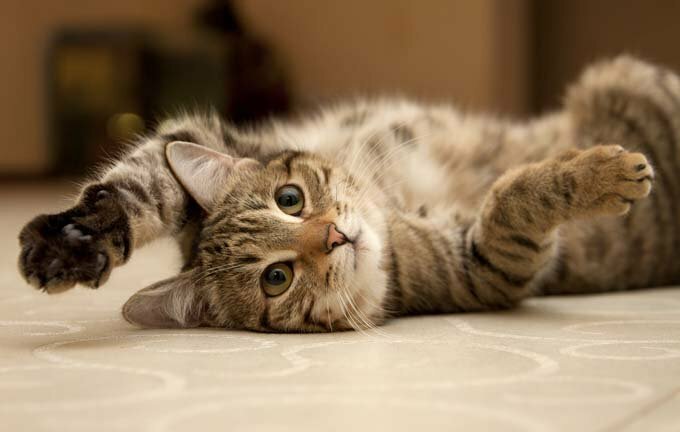 Check out our top ten favorite feline facts. 1. Cats lose their “baby teeth” when they are six months old. 2. A male cat is a tom, as everyone knows. A female cat is a molly. And an entire group is called a clowder. A group of kittens is called a kindle. 3. While there are about ten different vocalizations a dog is able to make, cats can make over 100 — meow! 4. The brain of a cat is biologically closer to a human brain than it is to that of a dog. 5. Cats can detect sound more acutely than humans can (no surprise), but they also have an even finer sense of hearing than dogs. 6. Cats have been known to run at speeds upwards of 30 mph. 7. While many cats lack eyelashes, whiskers are extremely important. They’re used to gauge spatial dimensions. 8. In some parts of the world — Australia, for example — black cats are considered a sign of good luck. 9. Cats may hiss — or even spit — at fellow cats, but they save their meows for communicating with people. 10. According to those that study this sort of thing, cats thinks of people as just larger versions of…cats.